What is a one wire alternator? Why does my new alternator have a smaller pulley? Why is output so low at idle? Can I use underdrive power pulleys? Will a higher amperage alternator cause any problems with my stock electrical system? What modifications will I need to make when upgrading to a high amp alternator? What does the rated output of your alternators mean? Will a high output alternator have a shorter lifespan? What alternators will interchange with each other? How do I wire an alternator in place of a generator? What should my system voltage be? How do I wire in auxiliary batteries to my system? A one wire alternator is used where you do not want to have any connection from a vehicle to operate an alternator. It will self-excite, meaning that it can start charging and stop charging all on its own. The only connection needed for a 1-wire alternator is the output charge cable. It is most commonly used in custom vehicles to clean up the wiring, replacing an alternator that used an external regulator, or adding a second alternator to the vehicle. The early GM 1-wire alternators (1972-1986) will need to have the RPM raised to 1000 ? 1200 RPM initially to get the alternator charging and then it will continue to charge after that. The later style GM and all Ford and other style 1-wire alternators will excite immediately when the vehicle is started. The one wire alternators cannot be used if you want to use a dash charging light. You would need to use the plug-in style regulator in order to complete the circuit to operate the light. How much amperage do I need? The alternator that was provided with your vehicle should handle all of its electrical needs as outfitted from the factory. If you have added electrical components such as stereo amps, lights, compressors, winch, plow, etc. then you will need to produce more power to operate these components. Use our Amperage Load Calculator to find out how much power you now need from an upgraded alternator. Alternators produce more amperage the faster they spin up to their maximum capacity. Most people need the best output they can get at low speed. When the engine is idling, the alternator will not produce as much power because it is turning slower. In order to boost output at lower RPM, it is beneficial to spin the alternator faster by using a slightly smaller pulley to accomplish this. In most cases you should be able to use the alternator with the smaller pulley without having to use a smaller belt. Check to make sure that your belt is not worn, stretched, or that the tensioner has the correct amount of tension to keep the belt from slipping or having too much tension. 1) Too much load - The amount of load (components using power) may be too much for the amount of output the alternator is capable of producing at that slower speed. Check the amperage output at the rear of the alternator and see if it is more or less than the amperage coming out of the battery's positive cable. If increasing the RPM of the engine slightly causes the alternator to exceed the requirements, then it may be necessary to use a higher rated alternator, raise the engine idle speed (if possible), or change to a smaller diameter pulley to increase output at that RPM,. 2) Idle Speed - Some newer vehicles have idle speeds much lower than earlier models. This is done to help the fuel economy. On these vehicles the use of a smaller diameter pulley is almost a necessity to get low RPM output to an acceptable level. You may find that at times the load demand may be greater than the available output of the alternator. There is no problem with having this condition for short periods such as heavy bass hits from the stereo. Using an auxiliary battery to add additional reserve capacity can help alleviate problems stemming from these circumstances. 3) Pulley ratio ? In order for the alternator to spin fast enough to produce the power necessary at low RPM, the pulley ratio should be correct. Changing the crankshaft pulley or alternator pulley will vary this ratio. For most vehicles the ratio should be at least 3:1. See the question "What is pulley ratio" to find out how to calculate this. 4) Wiring ? When upgrading to a high output alternator it is important to make sure that the power can get to where it needs to go. The factory charge cable and ground cables were designed to handle only as much amperage as the stock alternator could provide. 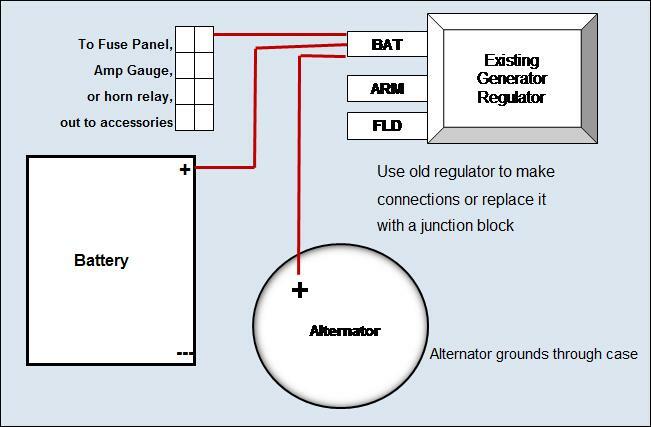 Using a higher amperage alternator, you need to upgrade the charge cable to handle the higher current that will be passing through or the power will be restricted. It is also necessary to upgrade the ground side as well. This would include the battery to frame, body, and engine block. The use of underdrive pulleys for the crankshaft has become popular but it has the downside of slowing alternator RPM. This will cause the alternator to have lower output at slow speeds. We recommend that the factory sized crankshaft pulley be used whenever you upgrade to a high output alternator. A higher amperage alternator will not pose any problems to the vehicle's electrical system. Amperage will flow to only those components that can use the energy and supply as much amperage as the component can consume. For example, you may have a 100 amp alternator in your vehicle and the turn signals have small wiring and will only use 10 amp of power. Upgrading to a 200 amp alternator will not affect these components. On externally regulated alternators you can still use the stock factory regulator. Of course you need to get the power to where it needs to go, so see the next question about modifications. Almost all of the alternators we sell are meant to be a direct replacement for your factory alternator so you should not have to modify the installation. You should, however, upgrade the alternator's charging cable and ground cables (battery to frame, body, and engine block) so that you can get the power to where it can be used. A smaller diameter alternator pulley is usually included with the alternator we provide and in rare instances a slightly shorter belt may be necessary. These figures are alternator RPM speed. In order to calculate the corresponding engine RPM you must divide those numbers by your pulley ratio. To calculate pulley ratio, see the next question. Pulley ratio is the comparison of the crankshaft pulley diameter to the alternator pulley diameter. In order to get your pulley ratio you would measure the diameter of your crankshaft pulley and divide it by the diameter of the alternator pulley you will be using. For example, if your crankshaft pulley is 6" in diameter and the alternator pulley is 2" in diameter, the ratio would be 3:1 or 6 2 = 3. The larger the ratio, the faster the alternator will spin. CLICK HERE to go to our pulley ratio chart. The high output alternators we design should be able to provide a long life. However, the more current that is produced by an alternator, the faster the brushes may wear. If you are using an alternator more toward its peak capacity it will tend to use more brush material. Luckily, replacing brushes on most alternators is relatively easy and very inexpensive. Even if you are running the alternator at peak capacity it should provide you with years of good use before you may need to do any maintenance. For GM, Ford, and Chrysler vehicles we have provided a list of the most popular interchangeable cases to help make finding a higher amperage alternator easier. CLICK HERE to see the list. If you do not find an option or are unsure of which one is correct, feel free to call us at (909) 794-1600 for assistance. 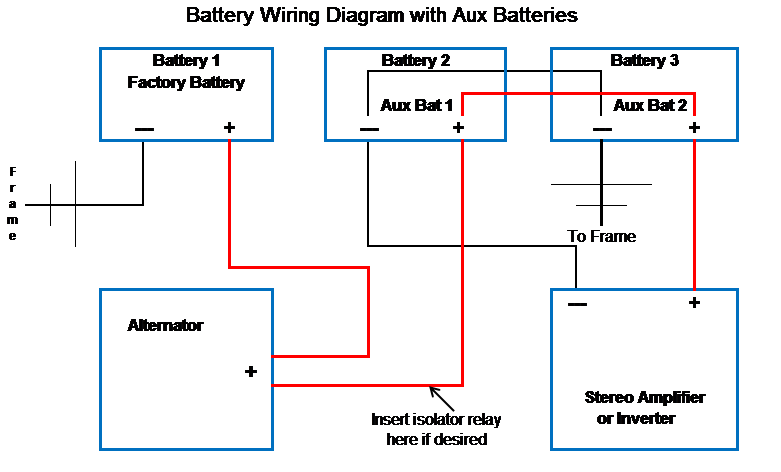 Since not all vehicles are wired exactly the same the picture below is a simple example of the wiring requirements for installing an alternator in place of a generator system. Using the original generator regulator as a junction to connect all of the positive wires makes it simple. You may also route the wiring in any fashion you like as long as the power is distributed to both the battery and the vehicle's electrical components. The Armature and Field wires that were previously connected between your old generator and regulator can be removed and discarded. If you have a dash light and want to use it , there is a small wire on the ARM terminal the comes from the ignition through the dash light. This is how the generator is excited also. If the Powergen has a provision for a dash light you would connect this small wire to the light wire terminal on the alternator/Powergen. The dash light bulb MUST be working or the light will not come on and turn off as the Powergen starts to spin. The alt/Powergen will still charge as it is a 1 wire unit but the dash light will not work. NOTE: The picture below is for negative ground systems. If you are connecting on a positive ground system then the cable at the battery will connect to the negative battery terminal. On a 12 volt system the high cutout voltage should be between 14.3 - 14.9 depending on the voltage regulator installed on your alternator. This voltage will be maintained when the battery is fully charged and the electrical load is low. As you add electrical load by turning on more accessories, the voltage will drop. By using Ohm's Law, you can calculate that when amperage goes up, voltage will go down. The higher the amperage load is to the alternator's maximum rated output, the lower the voltage will be. For example, if you have a 100 amp alternator and are using 80 amp, the voltage will be about 13.5V. If you bring your load up to 101 amp, then the voltage in the system will drop below 12.8V because the extra 1 amp that is needed and not coming from the alternator will have to be stolen from the vehicle's battery and hence the voltage will start dropping below the static battery level. Keep in mind that you might experience this scenario more often at idle speeds because an alternator will not be able to produce its rated capacity at low RPM speeds. Using a smaller diameter pulley or raising the vehicle's idle RPM can sometimes give you the added RPM to get the alternator to charge at a higher rate. How do I wire in auxiliary batteries in my system? If you are going to add additional batteries for your stereo, compressors, or inverter then you need to make sure that the power is circulated correctly. Wiring secondary batteries is easily done by following the diagram below. The most important thing is that the power goes in one end and exits the other. That way you will charge and discharge your batteries equally and be able to use the total amount of power in all batteries. It is OK for the alternator to have more than one charge cable on its output stud.